A Victorian Gothic church built in 1852 as an expression of the Ecclesiology movement. The result is an almost perfect time capsule of Victorian Gothic Revival. The architect was Thomas Bury, a pupil of AW Pugin. 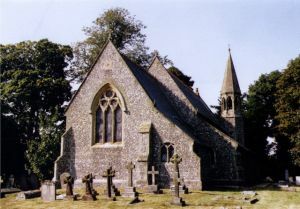 The exterior is simple, consisting of a nave and chancel, with a west tower and bell turret, all built of stone and flint, under a slate roof. The overall design mimics the Gothic style of about 1320. The church is laid out with a nave, chancel, and north aisle. The nave is three-bays long, and there is a sedilia and piscina in the chancel, all in Decorated Gothic style, as are the beautifully carved windows. Look for the small organ in a beautifully carved wooden case. The ornate reredos behind the altar was carved by John Bacon, father of the first parish priest. The interior boasts its original brass candleholders and coronas. The church is no longer used for regular worship and is in the care of the Churches Conservation Trust. It is usually open daylight hours to visitors.